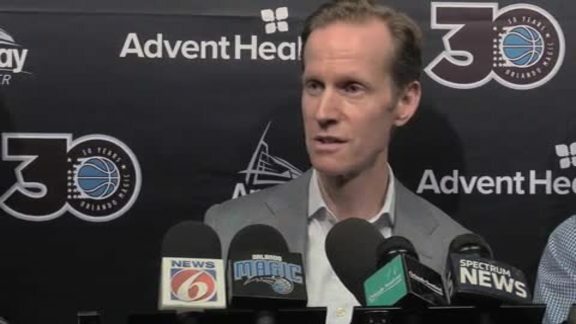 ORLANDO -- The Orlando Magic have acquired forward Jarell Martin (Ja-RELL) and cash considerations from the Memphis Grizzlies in exchange for center Dakari Johnson and the draft rights to guard Tyler Harvey, President of Basketball Operations Jeff Weltman announced. Martin (6’10”, 239, 5/24/94) played in 73 games (36 starts) last season with Memphis, averaging 7.7 ppg., 4.4 rpg. and 1.0 apg. in 22.7 minpg. He scored in double figures 23 times, including a career-high 20 points on Dec. 27 @ L.A. Lakers. Martin led (or tied) the Grizzlies in scoring once, in rebounding four times and in assists once. He pulled down 10+ rebounds five times, including a career-high 14 boards on Mar. 28 vs. Portland, and recorded two double-doubles. Martin also played and started in two games with the Memphis Hustle of the NBA G League, averaging 11.0 ppg., 5.5 rpg. and 1.0 apg. in 26.8 minpg. Originally selected in the first round (25th overall) of the 2015 NBA Draft by Memphis, Martin has appeared in 142 career NBA regular season games (39 starts), all with the Grizzlies, averaging 6.2 ppg. and 4.0 rpg. in 18.3 minpg. He has also played in 34 career games (27 starts) in the NBA G League with Iowa and Memphis, averaging 15.3 ppg., 7.0 rpg. and 1.0 apg. in 28.3 minpg. During his college career at Louisiana State University, Martin played in 65 games (57 starts) during two seasons from 2013-15, averaging 13.7 ppg., 6.9 rpg. and 1.4 apg. in 30.7 minpg. As a sophomore (2014-15), he played 33 games (32 starts) with the Tigers, averaging 16.9 ppg., 9.2 rpg. and 1.8 apg. in 35.1 minpg. Martin was a consensus All-SEC First Team selection and led LSU to their first NCAA appearance since 2009. Johnson (7’0”, 255, 9/22/95) played in 31 games (six starts) last season with Oklahoma City, averaging 1.8 ppg. and 1.1 rpg. in 5.2 minpg. He was acquired by Orlando along with cash considerations on July 20, 2018, in exchange for Rodney Purvis. Harvey (6’4”, 185, 7/17/93) was selected in the second round (51st overall) of the 2015 NBA Draft by the Magic out of Eastern Washington University.